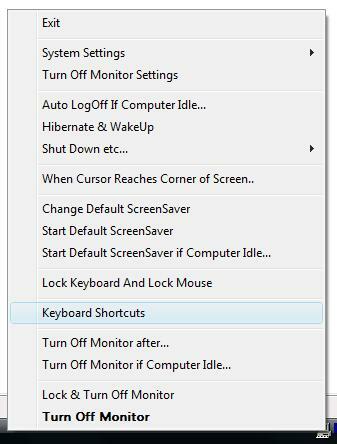 Right click on system tray menu of Turn Off Monitor Utility and click on Keyboard Shortcuts. In the Keyboard Shortcut screen, press the Keyboard shortcut key (e.g F3). Now click on the button on the extreme right labelled ... .
Now select a file, which can be an existing application / program or it can be a document file (e.g .txt file). In case you want some command line parameters to be passed, the enter them in the arguments edit box. Now click on the button labelled Add. The Application will display the Keyboard Shortcut with the file name & parameters(optional) in the list box. That's it, now you can click on the cross button on the xtreme top to hide the window). In case you wish to add more keyboard shortcuts or remove existing ones, you can double click on the system tray icon of the Keyboard Shortcut Utility. The Keyboard Shortcut System Tray will be visible in the system tray only when there are some keyboard shortcuts defined, else the utility can be launched only from the system tray menu of the Turn Off Monitor Utility. 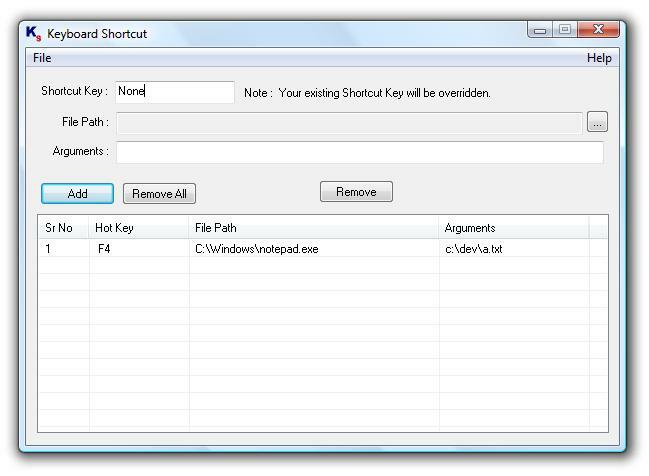 You can also get standalone Keyboard Shortcut Software Utility. In case you face any issues, please do write to us. Download Free Trial of Turn Off Monitor Utility Now. Please do write to support@rtsoftwares.com in case you face any issues with the software utility. You can also write to us in case you feel that some feature should have been implemented in a better way or you feel that another relative feature should be there in the software utility, or you feel that the Keyboard Shortcut utility can be made more useful / easy to use. Register your copy now (using PayPal Acount or Credit / Debit Card (without PayPal Account)) for instant full version download of Turn Off Monitor Software Utility : $5.00 and create Keyboard Shortcuts to easily access your programs / applications. Navigate to Turn Off Monitor Home and donwload other easy to use and inexpensive softwares.